(a) The U660E automatic transaxle does not have an oil filler tube and oil level gauge. When adding fluid, add fluid through the refill hole on the transaxle case. The fluid level can be adjusted by draining excess fluid (allowing excess fluid to overflow) through the No. 1 transmission oil filler tube of the oil pan. "Overflow" indicates the condition under which fluid comes out of the overflow plug hole. (b) Before adjusting the fluid level, add the specified amount of fluid when the engine is cold and warm up the engine to circulate the fluid in the transaxle. Ensure that the fluid temperature is as specified and the engine is idling. (c) The U660E automatic transaxle requires Toyota Genuine ATF WS. (d) The adjustment should be performed according to the procedures and notes. (a) The adjustment should be performed according to the procedures referenced in the work flow below. Set the vehicle on a lift so that the vehicle is kept level when it is lifted up. (b) Remove the No. 2 engine under cover and front fender apron LH. 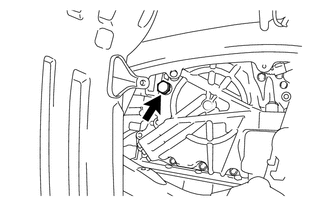 (a) Remove the refill plug and gasket from the automatic transaxle. After performing any of the following operations, it is not necessary to perform the initial filling procedure. Proceed to the Add Specified Amount of Fluid procedure. If ATF comes out after removing the overflow plug, wait until the fluid flow slows and only drips come out. If ATF comes out, it is not necessary to perform the initial filling procedure. After checking the tightening torque of the No. 1 transmission oil filler tube, temporarily tighten the overflow plug. (c) Using a 6 mm socket hexagon wrench, check that the No. 1 transmission oil filler tube is tightened to the specified torque. If the No. 1 transmission oil filler tube is not tightened to the specified torque, the amount of fluid cannot be precisely adjusted. To check the torque of the No. 1 transmission oil filler tube, insert the socket hexagon wrench into the overflow plug hole. 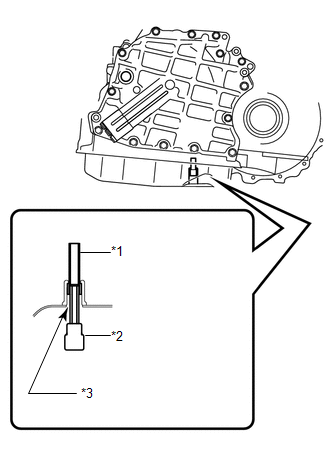 (1) Fill the transaxle through the refill hole until fluid begins to trickle out of the overflow plug hole. (e) Wait until the fluid flow slows and only drips come out. (f) Temporarily install the overflow plug. Reuse the old gasket. The plug will be removed again to adjust the fluid level. 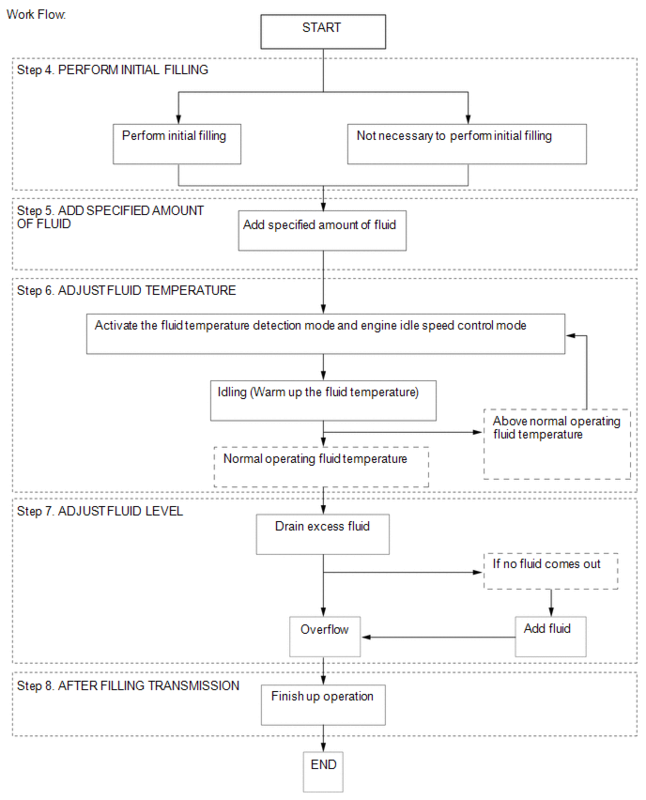 (a) Fill the transaxle with the correct amount of fluid as listed in the table below. Refill amount differs depending on the operation that was performed. (b) Temporarily install the refill plug to avoid fluid spillage. The actual ATF temperature can be checked on the Data List using the Techstream. (1) Connect the Techstream to the DLC3 with the ignition switch off. (2) Turn the ignition switch to ON and turn the Techstream switch on. Check that electrical systems such as the air conditioning system, audio system and lighting system are off. (3) Enter the following menus: Powertrain / ECT / Active Test / Connect the TC and TE1. (4) Select the Active Test menu: Connect the TC and TE1 / ON. (5) Select the Data List menu: A/T Oil Temperature 1. (6) Check the ATF temperature. If the fluid temperature is 45°C (113°F) or more, turn the ignition switch off and wait until the fluid temperature drops below 45°C (113°F). (7) Depress and hold the brake pedal. (9) Slowly move the shift lever from P to D, then back to P.
Slowly move the shift lever to circulate the fluid through each part of the transaxle. (10) While observing the D shift indicator on the combination meter, move the shift lever back and forth between N and D at an interval of 1.5 seconds for 6 seconds or more. Do not pause for more than 1.5 seconds. Performing this operation will cause the vehicle to enter the fluid temperature detection mode. (11) Check that the D shift indicator comes on for 2 seconds. When the fluid temperature detection mode is activated, the D shift indicator on the combination meter comes on for 2 seconds. If the D shift indicator does not come on for 2 seconds, return to the step where terminal TC is first connected and perform the procedure again. 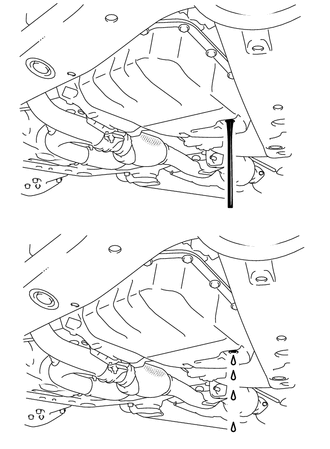 (12) Move the shift lever from N to P.
(13) Release the brake pedal. (14) Select the Active Test menu: Connect the TC and TE1 / OFF. 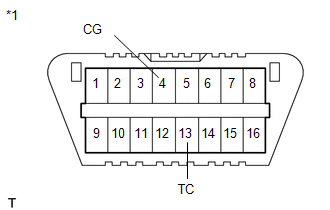 Be sure that terminals TC and TE1 are not connected. If the terminals are connected, the fluid level cannot be precisely adjusted due to fluctuations in engine speed. Disconnecting terminals TC and TE1 activates the engine idle speed control mode. In the engine idle speed control mode, engine idle speed control starts when the fluid temperature becomes 35°C (95°F) or more and the engine speed is maintained at approximately 800 rpm. Even after terminals TC and TE1 are disconnected, the fluid temperature detection mode is active until the ignition switch is turned off. (15) Warm up the engine with the engine idling until the fluid temperature reaches the normal operating temperature (40 to 45°C [104 to 113°F]). If the fluid temperature is within the normal operating temperature range, immediately proceed to the Adjust Fluid Level procedure. If the fluid temperature is 45°C (113°F) or more, stop the engine and wait until the fluid temperature drops to 40°C (104°F) or less. 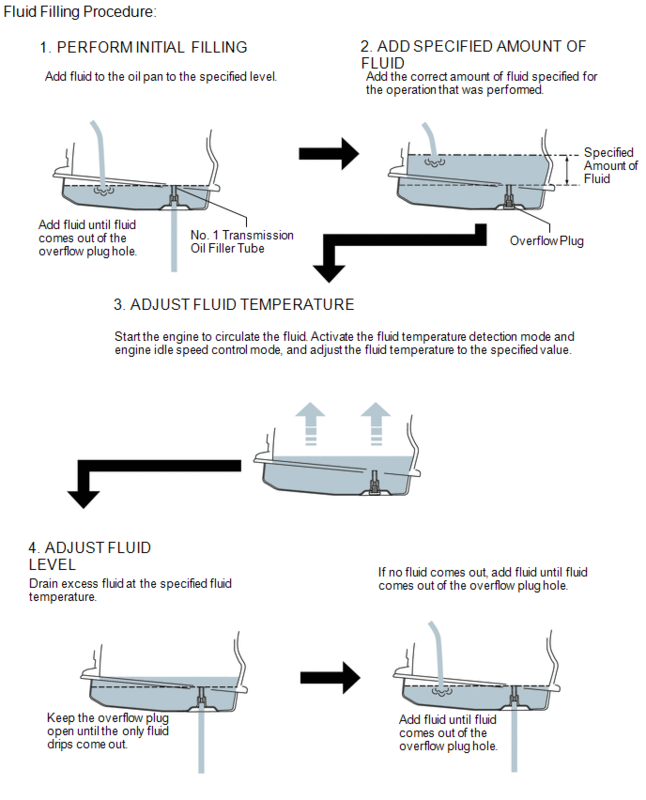 Then perform the Adjust Fluid Temperature procedure again from the beginning. In the fluid temperature detection mode, the D shift indicator comes on, goes off, or blinks depending on the fluid temperature. (1) Using SST, connect terminals 13 (TC) and 4 (CG) of the DLC3 with the ignition switch off. (2) Depress and hold the brake pedal. The indicator lights on the combination meter blink to indicate the DTC output when terminals TC and CG are shorted. (4) Slowly move the shift lever from P to D, then back to P.
(5) While observing the D shift indicator on the combination meter, move the shift lever back and forth between N and D at an interval of 1.5 seconds for 6 seconds or more. 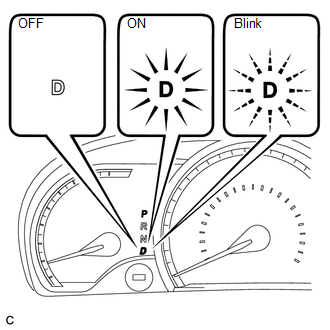 (6) Check that the D shift indicator comes on for 2 seconds. 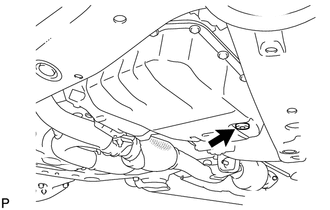 (7) Move the shift lever from N to P.
(8) Release the brake pedal. (9) Remove SST from terminals 13 (TC) and 4 (CG). Be sure that terminals TC and CG are not connected. If the terminals are connected, the fluid level cannot be precisely adjusted due to fluctuations in engine speed. Disconnecting terminals TC and CG activates the engine idle control mode. Even after terminals TC and CG are disconnected, the fluid temperature detection mode is active until the ignition switch is turned off. 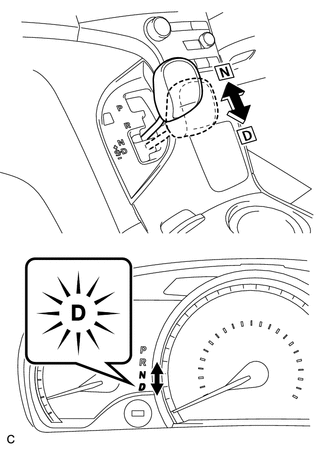 (10) Allow the engine to idle until the D shift indicator comes on again. If the D shift indicator is on, immediately proceed to the Adjust Fluid Level procedure. If the D shift indicator blinks, stop the engine and wait until the fluid temperature drops to 40°C (104°F) or less (the indicator goes off). 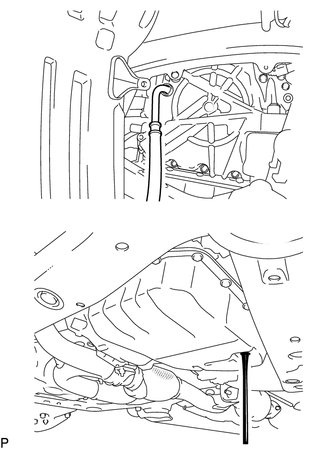 Then perform the Adjust Fluid Temperature procedure again from the beginning. Fluid filling procedure should be performed when the D shift indicator is on (the fluid temperature is within the normal operating temperature range). Use caution while the engine is idling and the radiator fan is operating. (b) Adjust the fluid level. (1) Using a 6 mm socket hexagon wrench, remove the overflow plug and gasket. Be careful as the fluid coming out of the overflow plug hole is hot. (2) Check the amount of fluid that comes out of the overflow plug hole. If only a small amount of fluid (approximately 1 cc) comes out of the overflow plug hole, then only fluid remaining in the No. 1 transmission oil filler tube has come out. This condition is not considered as overflow, so it is necessary to add fluid. (3) If the amount of fluid that comes out of the overflow plug hole is large, wait until the fluid flow slows and only drips come out. (4) If no fluid comes out of the overflow plug hole, remove the refill plug and gasket. Then add transaxle fluid through the refill hole until fluid comes out of the overflow plug hole. Wait until the fluid flow slows and only drips come out. (5) Check that the fluid flow has slowed and only drips come out. The fluid flow will not completely stop because the fluid expands as its temperature increases. (c) Install the overflow plug with a new gasket. (d) Install the refill plug with a new gasket. Turning the ignition switch off exits the fluid temperature detection mode. (g) Remove the Techstream from the DLC3 (when using the Techstream). (d) Install the front fender apron LH and No. 2 engine under cover.